How is your day going? Do you have some time set aside this week to create something beautiful? I don't know about you, but I find when I sit down to create; something happens deep inside me. I get rejuvenated, inspired, somehow the stresses and worries of everyday life melt into a puddle on the floor.....and in the process....if you choose to give away your hand stamped card or project, you have the deep satisfaction of brightening someone else's day and letting them know how much you care! It's a double blessing. I encourage you to take a couple minutes or maybe an hour to peruse the blog today and be inspired to create something beautiful and create your own butterfly dreams from the comforts of your crafting space! If you missed out on the Butterfly Dreams release, follow this link: http://hcgo.co/ButterflyDreams to see all the details! Get yours today and you will be on your way to joining the hundreds of crafters who are already having fun creating with this new collection. Instructions: Cut cream cardstock to 10 x 7" size, score and fold at 5" to create card base. Cut an orange patterned piece of paper from the collection to 6 1/4 x 4 1/4" size and attach to the center of card base. Cut a floral patterned paper from the collection to 6 3/4 x 4 3/4" size panel. 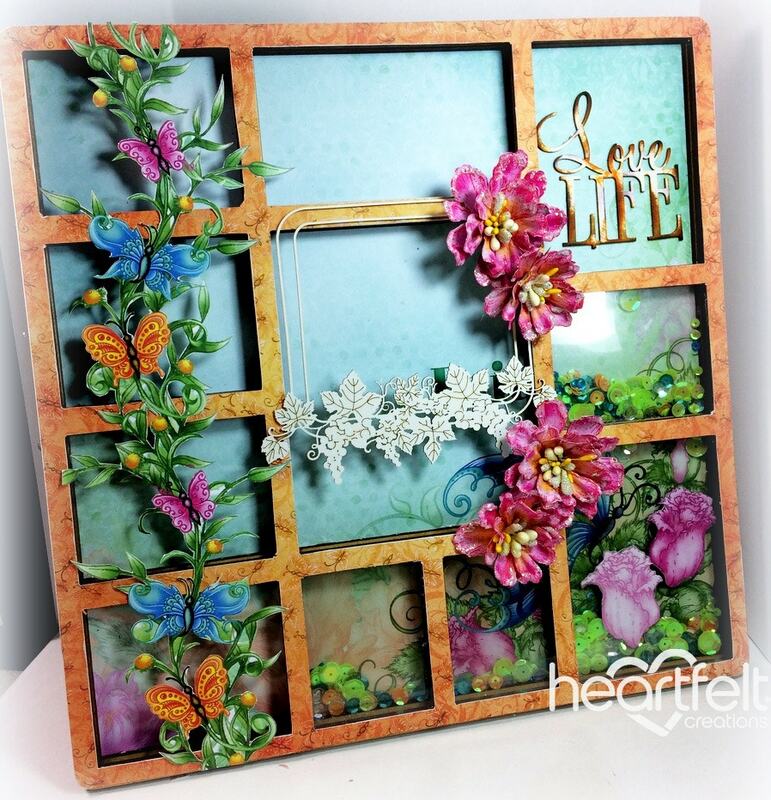 Use the border outline from HCD1-7177 Butterfly Dreams Border to diecut an opening at an angle on floral panel. Sponge edges of panel with Garden Patina ink. Stamp the butterfly border (2x) from the HCPC-3823 Butterfly Dreams Border stamp set in Cactus Flower ink onto white cardstock and diecut with coordinating die. Trim around the edges of 1 border, leaving at least 1/4" edge. Cut 2 small butterflies from the other border. Stamp large butterfly from HCPC-3824 Fluttering Butterfly Cling stamp set in Cactus Flower ink onto white cardstock and diecut with coordinating die. Stamp the curved Fluttering sentiment in the same color ink onto white cardstock and fussy cut with scissors. Cut the decorative square from HCD1-7179 Butterfly Kisses Decorative die, from white cardstock. Trim off 2 of the corners for accents. Use the Stack and Store daubers to color butterflies and border. For the large butterfly, use Cactus Flower on wings and bottom tendrils. Use Garden Patina on the body and top tendrils of butterfly. Use a variation of Cactus Flower, Sunflower and Garden Patina on the butterfly border and small butterflies. Sponge edges of sentiment with Cactus Flower ink. Use the stylus from the Deluxe Flower shaping kit to shape the large butterfly and small ones. Attach the butterfly border on back side of floral panel behind opening. Use dimensional adhesive to attach panel onto card base. Use a sponge to dab some Dries Clear glue onto the large butterfly and corner accents. Sprinkle with Frosting powder. 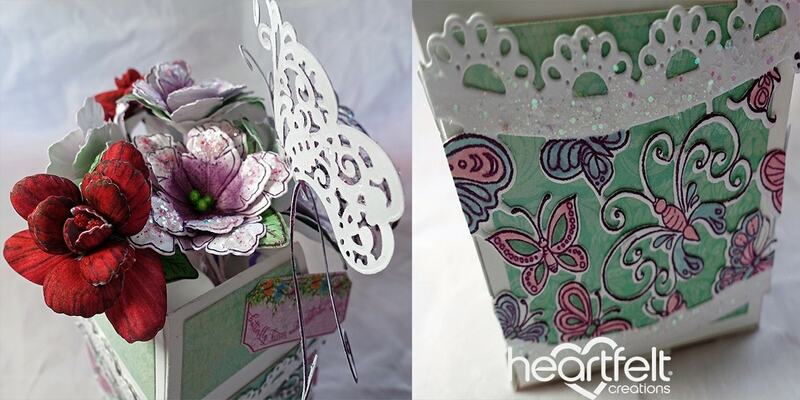 Attach butterflies, corner accents and sentiment onto card as shown. Use the Dries Clear glue along with the Crystal glitter over the butterflies, florals and rest of card as desired. Instructions: Cut white cardstock to 8 1/2 x 5 1/2" size, score and fold at 4 1/4" to create card base. Using from the HCD1-7120 Fleur Border Basics die, diecut a wavy edge along the front flap of card. Stamp the border from HCPC-3823 Butterfly Dreams Border in Cactus Flower along the coordinating wavy edge of card base. Use the matching die to diecut the border. Cut a 5 1/4 x 2" strip from 6 x 6" panel within the paper collection. Diecut a wavy edge along the side of strip to match the card base edge. Diecut a Fleur border from white cardstock to match the wavy edge of strip. Cut a 4 x 5 1/4" panel from the 6 x 6" cage panel in paper collection. Cut the 'Hug' sentiment from the paper collection. Sponge the edges of front flap, panel, strip, sentiment and Fleur border with Vibrant Fuchsia ink. Stamp the butterfly from the HCPC-3825 Butterfly Kisses stamp set in Cactus Flower ink onto white cardstock and diecut with coordinating die. Use the Stack and Store daubers to color butterfly border and butterfly. For the butterfly wings, use Vibrant Fuchsia and Vivid Chartreuse. For the body and tendrils, use Garden Patina ink. Use a variation of Garden Patina, Vibrant Fuchsia and Vivid Chartreuse on the butterfly border. Use the stylus from the Deluxe Flower shaping kit to shape the butterfly. Attach the panel, strip, Fleur border onto card as pictured. Attach butterfly and sentiment. Use the Dries Clear glue along with the Baby's Breath glitter over the butterfly and rest of card as desired. Instructions: Cut white cardstock to 8 1/2 x 5 1/2" size, score and fold at 4 1/4" to create card base. Cut panel from the paper collection to 3 3/4 x 5 1/4" size. Cut the narrow butterfly border strip to 5 1/4" length. 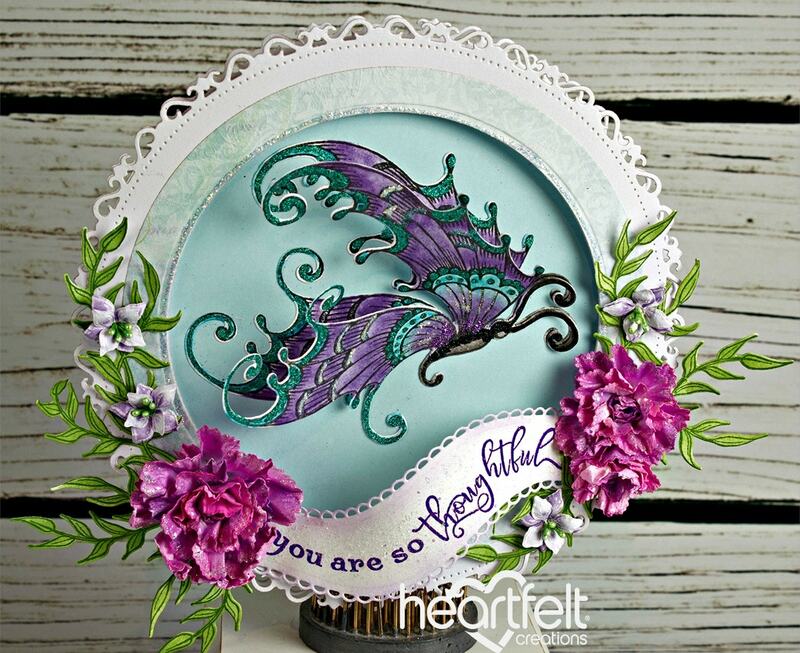 Using from the HCD1-7179 Butterfly Kisses die, diecut the round doily from white cardstock. Cut doily in half. Stamp the 'Fluttering' sentiment in Vibrant Fuchsia ink onto white cardstock and diecut with the coordinating borders from the Classic Borders set. Sponge the edges of card base, panel, border strip and sentiment with Vibrant Fuchsia ink. Use dimensional adhesive to attach panel onto card base. Attach doily pieces behind the border strip as pictured, then attach onto card. Attach the sentiment onto the card. Stamp the butterfly border from the HCPC-3823 Butterfly Dreams Border stamp set in Cactus Flower ink onto white cardstock and diecut with coordinating die. Use the Stack and Store daubers to color butterfly border. Use a variation of Garden Patina, Vibrant Fuchsia and Vivid Chartreuse on the butterfly border. Use the stylus from the Deluxe Flower shaping kit to shape the butterfly. Cut apart the main butterfly from border. Use glue and dimensional adhesive to attach onto card. Use the Dries Clear glue along with the Baby's Breath glitter over the butterfly border and rest of card as desired. Instructions: Cut a piece of white cardstock 5 1/2" x 11", score at 5 1/2" along the long side and fold to create a 5 1/2" x 5 1/2" card. Using the decorative die from the HCD1- 7144 Decorative Medallion Die set die cut the front edge as shown. Cut a piece of patterned paper featuring the butterfly border 5 1/2" x 2" and adhere to the front left border. Cut a piece of coordinating aqua patterned paper 5 1/2 x 5 1/2" and adhere to the back of the card. Stamp the leaf image from the HCPC3811 Rain Boots and Blossom Stamp in Fern Green ink on white cardstock, colour with Leaf Green ink and die cut with the coordinating die. Shape lightly and adhere around the butterfly border image on the paper. Stamp the image from the HCPC-3823 Butterfly Dreams Border Stamp 4 times in Tiger Lily, Fern Green, Manganese Blue and Vibrant Fuschia on white cardstock. Colour the green leaves and flourishes with Leaf Green ink, the bottom butterfly in Buttercup ink, the middle butterfly in Garden Patina ink and the top butterfly in Vibrant Fuchsia ink on all the images and die cut with the coordinating die. Trim the pink, yellow and blue butterflies from the border and adhere them to the image stamped in Fern Green ink. Adhere to the front of the card over the leaves as shown. Add the Dandelion Yellow Nuvo drops to the image as shown. Add Crystal Clear to the butterflies using Dries Clear on a damp sponge. Cut the sentiment out from the patterned paper, shape and adhere to the card as shown. Instructions: Cut card base from white card stock to make an 8" x 8" card. Cut out pattern paper in subtle background from the paper collection, 1/4" smaller than the card front and adhere on the card with clear glue. Cut another pattern paper, 6" x 6" and tear it diagonally and keeping a gap in between, adhere the two triangles as shown. Cut out a die cut from window frame die set and insert in the card panel gap between the triangles. Cut out another die cut from the window box elements decorative frame die set and the eyelet oval frame set. Distress the oval frame with pink ink. Add some clear glue and apply glass shards. Cut another oval base, stamp the sentiment and adhere to the oval frame. Apply some glue in a corner and add some beads. Adhere the oval die cut shape in the centre of the card panel. Tuck in the two decorative dies as shown. Stamp the peony flowers image with rose madder ink and colour with same ink. Stamp the leaves from classic rose die leaves and flowers. Cut with coordinating dies. Shape the flowers and leaves on the tool kit. Join the layers to form flowers and add rice pollens tied together. Arrange the flowers and leaves on the left side of oval die cut. Stamp the butterflies in vibrant fuschia and cut with coordinating die. Add a little colour with zig markers and wash the colours with water colour brush. Finish the card by adhering the butterflies on the card front. Instructions: Click here to view a larger photo of this project. To create this decorative frame, you will cover the backdrop and frame front with your patterned paper by carefully cutting it to the shape of the frame. For the portion of the frame that has shaker sequins you will need to cut acetate to the size of the opening and adhere it to the frame before covering with patterned paper. Now fussy cut your butterfly vine from the sheet of patterned paper and adhere to the left side of the frame. For the flowers you will stamp your peonies using the large and small sets. Using red versafine ink stamp a total of 4 smaller peonies and 2 large, which you will shape using the deluxe flower shaping kit and then layer on top of each other staggered. Pierce the centers and add 1 yellow beaded stamen to the centers. Then apply some frosting powder to the tips with dries clear adhesive. Once complete add the Scrapiniec wood embellishments to your frame. The sentiment can be placed in any of the openings and I chose the top right open frame. Adhere your flowers around the wood centerpiece to finish the look. Instructions: The ready side fold card measures 6 1/2" by 7 1/2". The first card layer is from teal blue cardstock and measures 6" BY 7". The next card layer is made using white cardstock and measures 5 3/4" by 6 3/4". The ready fancy top layer measures 5 1/2" by 6 1/2". This layer is created using the combination of 2 pattern papers. Choose both the pattern papers from the paper collection. Cut a piece of orange pattern paper measuring, 3" by 5 1/2". Cut the top using Fleur Border Basic die and glue a fancy die cut border from behind. The paper with peonies pattern measures 4' by 5 1/2". Layer them together to create a fancy card panel. Stamp one large Peony Blossom, one large bud and 2 smaller buds using black archival ink on watercolor paper and die cut them using its coordinating dies. Using a watercolor brush, paint the images with Zig Markers. Also stamp the butterfly image twice with Teal Color Stazon on smooth white cardstock, cut it using its coordinating die and paint it using Zig Markers. 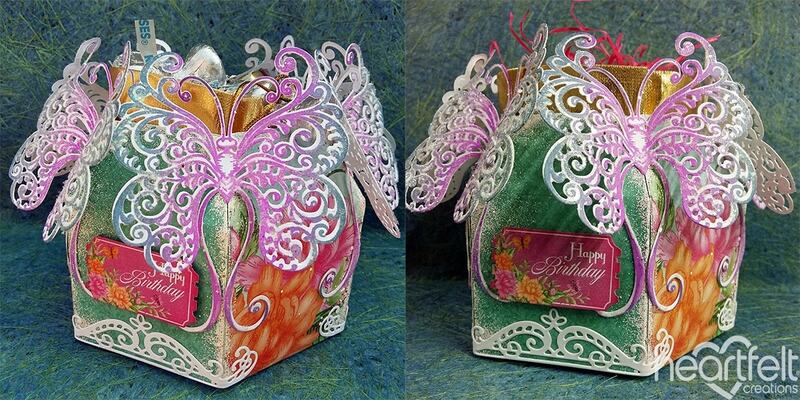 Create a 2 layered butterfly embellishment by embossing the butterfly wings from the back. Cut a circle from a pattern paper and layer it on the Butterfly Kisses circle doily. Also, layer all the stamped images as shown. Add sentiment and randomly add sparkle using Crystal Clear Powder and Adhesive that dries clear. Instructions: The finished size of this square tent fold card is 6.299" x 6.299" (16 cm x 16 cm) To make the flowers: Taking the design paper scraps from the collection use the classic rose stamp and die set to make the rose petals. Use the distress inks to bring color to the leaves, rose petal tips and centers. Spray the petals and leaves with the water mister, place in the rose mold then put the mold through the die cutting machine twice to get a good press. (Do not make the paper or card-stock too wet as the paper will break in the mold when you put it through the die cutting machine. If you do make it too wet, leave to dry until they are just moist just as you would when balling to bring shape to the petals with the tools.) For the blue / green colored flowers, these are sprayed with the Lindy's stamp gang sprays-Grab a Guy Gold, Hydrangea Blue, Ponderosa Pines Olive Spray, also the cut away inner part of the eyelet frame that was put aside. Leave to dry a little, as the petals will still be too wet. When ready put these through the machine in the rose mold. Take the petals out of the molds with the aid of the piercer tool found in the flower shaping tool kit. Leave the shaped petals to dry completely. When dry, shape the centers so the petals cup up. Prick a hole in the petal center so you can thread the stamens through the opening. The stamen colors used are the pink and the green found in the bright pearl assortment bundle. Take three stamens, fold in half then thread the stems through the hole. Secure at the back with the hot glue gun. When the glue is cooled off, trim the excess stems away. To make the card base: Taking the white cardstock, cut the card base to 6.299" x 6.299" (16 cm x 16 cm) x2. In one of the cards make a 0.59" (1.5 cm) fold in the top, add double sided tape to the fold. Placing both pieces together this will form the tent fold card base. Taking the orange card-stock cut matting (15 cm x 15 cm) And (14.5 cm x 14.5 cm). Find from the paper collection the design paper used and cut this a little smaller than the card-stock mattings. Adhere together the matting and matching design paper using double sided tape or clear drying glue. Stamp the sentiment with VersaMark, sprinkle with gold embossing powder and heat set with the heat tool. Adhere the two layers together using the 3d foam tape or dots. Adhere to the card front. Using the above inks, stamp, diecut and color the Butterfly Dreams Border 2 times. Fussy cut the butterflies from the second one, color and shape them using the Deluxe Flower Shaping Kit and adhere to the first diecut to give the butterflies dimension. Using the Fleur Border Basics plain dies, cut out the Butterfly Border. From orange cardstock, cut two borders from the Elegant Border Basics dies and adhere to the Butterfly Dreams border. Adhere the border, flowers and leaves to the card base as shown. Add stickles to the flowers, leaves, butterflies and borders. Using a sponge and dries clear glue, add Rajni Chawla's Crystal Clear to the butterflies. Instructions: My card size is 5 1/2 X 5 1/2". Make card base and cover with a piece of the paper collection. Glue the Half Pearls to the card front. Next stamp the Butterfly Border using Memento Tuxedo Black ink and color using the Dove Blender Pen and various ink colors. Use the coordinating die to cut out the image and then add glitter to the butterflies and flowers. Find a tag on the paper and use the coordinating die to cut out. Adhere to card front with dimensional tape and then add a half pearl to the edge of the tag. Other Products: White Card Stock, Spellbinders Grand Circles, Spellbinders Grand Decorative Circles One, Archival Watering Can Ink, Pebbles Metallic Chalks, Quickie Glue Pen, Micro Glitter (Teal and Black), Versamark, Vintage Pink Embossing Powder, Super Fine White Detail Embossing Powder, Violet Embossing Powder and die cutting machine. Instructions: Click here to see a larger photo of this project. My card measures approximately 6" round. Using one of the Spellbinders Grand Decorative Circles One, create your card base out of white card stock using the Spellbinders Grand Circles die to make your window. After your base for the card is created, cover the front of the card with paper from the Butterfly Dreams Paper Collection. The large butterfly was stamped on white card stock using Watering Can and die cut with the matching die before coloring with a combination of Teal ink and Metallic chalks before accenting with a quickie glue pen and a combination of Teal and Black micro glitter. The Carmelia Carnation flowers were stamped on white card stock using versamark and heat embossed with vintage pink embossing powder before die cutting with the matching dies and coloring with Magenta Hue and Violet inks finally shaping with the 3D Floral Basics Shaping Mold and the flower shaping tools. The leaf flourishes were stamped on white card stock using olive ink and die cut with the matching die before distressing with bamboo leaves ink. The Lilac flowers were stamped on white card stock using versamark and heat embossed with super fine white detail embossing powder before die cutting with the matching dies and colored with violet ink and shaping with the 3D Lush Lilac Shaping Mold and the flower shaping tools before finally accenting the centers with stamens. The sentiment was stamped on white card stock using VersaMark and heat embossed with violet embossing powder before die cutting with the Fleur Border Basics Die and attaching as shown. Instructions: Card size: 5 1/2 x 7". Make card base and cut a piece of decorative paper from the Butterfly Dreams paper to cover the front leaving about 1/16" border of white. Use a coordinating paper to cover the front of the shadow box then use the square die to cut out the window. Cut another piece of decorative paper for inside the box and then put the box together. Sponge pink ink around all the edges. Glue box to card base on the right side of base. Stamp Sentiment using Vibrant Fuchsia on white then use the plain edge of the Delicate Border to die cut the sentiment. Sponge pink on the edges. Cut 2 Delicate Borders out of light green stock to match paper and glue to edges of sentiment. Die cut 3 Festive Holiday dies, place 2 at an angle on the top portion of the shadow box then glue sentiment on top. Glue the 3rd Festive Holiday die on the left side, on card base. Stamp, die cut and sponge color on the Butterfly Dreams Border, Wildwood florals, Petunia Blossoms and leaves. Shape leaves, and Wildwood Florals with Deluxe Flower shaping kit and round the backs of butterfly wings with the large stylist as well. Place the petunias in mold and mist then run through die cutting machine. Pinch petunia petals to pleat and ruffle. Let them dry completely then pierce each one in the center and add stamen one layer at a time gluing between each layer. Add Prills to centers of Wildwood Florals. Cut one butterfly completely off one of the Butterfly Dreams borders to stand alone. Add Stickles to Butterfly wings and stems of the Butterfly Dreams border (there are two different borders in the Butterfly Dreams Border). Add Cosmic Glimmer glitter to the little round blossoms on the Butterfly Border. Glue the Butterfly Border to the left side of the shadow box and the single butterfly to the top right. Glue the leaves and blossoms on the left side, on the base, over the Festive Holiday die. Instructions: Layout is 12x12". Black cardstock is your background. Cut a strip of the light polka dot pattern that is 2.5x11". Distress the edges and adhere to the left hand side of the layout using crafty foam tape. Cut 2 strips each of the dark coral, orange and teal patterned papers that are 1.5x8.5". Distress the edges and adhere to the right hand side of the layout slightly spaced apart, using crafty foam tape. Cut 5 pieces of the tan patterned paper that are 1.5x5.5". Distress the edges and adhere on the right hand side of the layout on top of the color strips using crafty foam tape again. Find and cut out the scalloped orange border strip and adhere to the left hand side of the layout. Cut a strip of white cardstock that is 1x12". Distress the edges and adhere next to the border strip. Mat the 4x6 photo in white and black cardstock. Add white photo corners to the photo. Adhere to the right hand side of the layout using 3D foam squares. Find and cut out the light mini tag using the coordinating die. Add above the matted photo and add a black burlap string bow. Die cut 1 small white doily die image and adhere to the right of the matted photo. Adhere the title glitter word to the top section of tan patterned paper and add the other portion of the title using smaller letter stickers just above. Stamp 2 sets of the Butterfly Dreams Border using an embossing pad, add black embossing powder and heat. Die cut these out. Stamp 1 large Fluttering Butterfly image again using the embossing pad and black embossing powder. Die cut. Add color to the butterfly images using Chameleon Pens. The butterfly bodies I used brown (BR5 Bark). The floral puffs I added color using OR3 Tangerine. I used a mixture of OR3 Tangerine, RD2 Red Coral and the Red Coral Color Top to add color to the wings of the butterflies. Adhere one full butterfly border to the bottom of the white cardstock border using 3D foam squares. Cut just the top portion of the other butterfly border off and adhere to the top of the white cardstock border again using 3D foam squares. Adhere the large butterfly in the middle of the borders again using 3D foam squares. Add a few black gems. Other Products: Distress Ink (Picked Raspberry, Squeezed Lemonade), Foam tape, double sided tape, Sizzix, Trimmer, Zig brushes, Heat Embossing Ink, Chipboard, silver card stock. Instructions: Click here to view a larger photo of this project. It's a small cute round easel card created with the decorative dies, enchanted Mum flowers and beautiful butterfly. Die cut 2 decorative round pieces from a white card using the Eyelet Circle & Basics Small Die. Take a smaller circle size and die cut 2 pieces from the butterfly pattern paper collection. Distress the edges and then glue it to the base. For the easel, score at the middle and then fold the circle in half, which will form the easel base. For the pattern paper cut it in half, distress the edge and then glue it to the easel base. For the Easel card take a further smaller die from the circle basic small die and die cut a pattern paper. For the next layer die cut a piece from the butterfly decorative circle die using a white card stock and then glue it to the middle of the pattern paper. Take the smallest circle die and die cut it from black card stock. Die cut the word Thank you from silver card stock and glue it to the center. As a decorative accent, tuck in a decorative doily at the top. For the flowers stamp and die cut several pieces of the enchanted Mum collection from a white card stock and plum archival ink. This time instead of spraying with water I have sprayed with some spray alcohol ink, which stained the flowers yellow. Later heat dry them after shaping. Once the flowers are dried add more shades of dried marigold and picked raspberry. Heat set them again and at the end dab some glossy accents on the petals tip and sprinkle some crystal clear. For the leaves it is shaded using library green and leaf green archival ink and also sprinkled with crystal clear and heat set after shaping the leaf ends. Stamp the butterfly image onto a white card stock using embossing ink sprinkle with silver embossing powder and heat set. Color the stamp and embossed image with zig brushes and then die cut using the coordinating die. Arrange the butterfly and then flowers around the thank you sentiment and then place a fussy cut sentiment from the paper collection. Add some pearls to the center of the butterfly and finish the card. Other Products: White cardstock, Blue Marker, Yellow Marker, Versa Mark, Black Embossing Powder, Distress edger, Foam Dots, Vellum cardstock. Instructions: Prepare a card base of white cardstock 5 x 7". Cut a piece of the Butterfly Dreams paper down to 4 3/4 x 6 3/4. Distress the edges with the Leaf Green then the edger, place foam dots on the back and adhere to the card. Choose another piece from the paper collection, use the Oval die with the scalloped edge and cut one out. Use the next size down and cut another piece from the paper collection, place foam dots on both, put together and adhere to card. Stamp the leaves on white cardstock with the Fern Green, color in with the Leaf Green, cut out using the matching die, shape using the Roses Flower Mold, arrange around the left side of the oval. Stamp the flowers on white cardstock with the Vibrant Fuchsia and color in with the Magenta Hue, cut out with the matching die, shape using the Floral Basic mold, finish shaping with the Flower Shaping Kit, add by arranging them on and around the leaves. Stamp the Butterfly on Vellum with the Versa Mark and heat using the black powder. Cut out using the matching die, use a marker brand of your choice and color the Butterfly Yellow and Blue. Shape and adhere to card on the right side. To finish the card, add glitter to all the flowers and leaves and Prills to the centers of the flowers. Instructions: Click here to view a larger photo of this project. Take white Cardstock and cut six panels of box die and cut the upper folds. Then layer these panels with pattern paper and distress the edges. After distress on the edges dab VersaMark ink and sprinkle some embossing enamel powder- aged ivory and heat them with heat tool. Now cut three dies from window box elements die and paste them at the bottom of the box as shown on the picture. Next for the butterfly, create six butterflies by stamping on the white cardstock from Fluttering Butterfly Cling stamp set using archival ink-Cactus Flower, mixing with hero arts ink-pool to navy. Shape them with Deluxe flower shaping tool set, adhere them using hot glue gun and then using dries clear glue sprinkle them with crystal clear powder, as shown. Now add the sentiment from pattern paper collection with foam tape. Instructions: My card is 4 1/4 x 5 1/2. Make card base and cover with a piece of the paper collection. Stamp the butterfly with black ink and color using the sponge daubers and ink. Use the coordinating die and cut out. Add the prills to the body of the butterfly and the crystal clear here and there over the rest of the butterfly. Set aside to dry. Using the Decorative dies cut out the pieces and glue to the front of the card. Next I used the double dots and adhered the butterfly to the center of the die cuts. Stamp the sentiment along the right side of the card using black ink. Instructions: Click here to see more photos of this project. 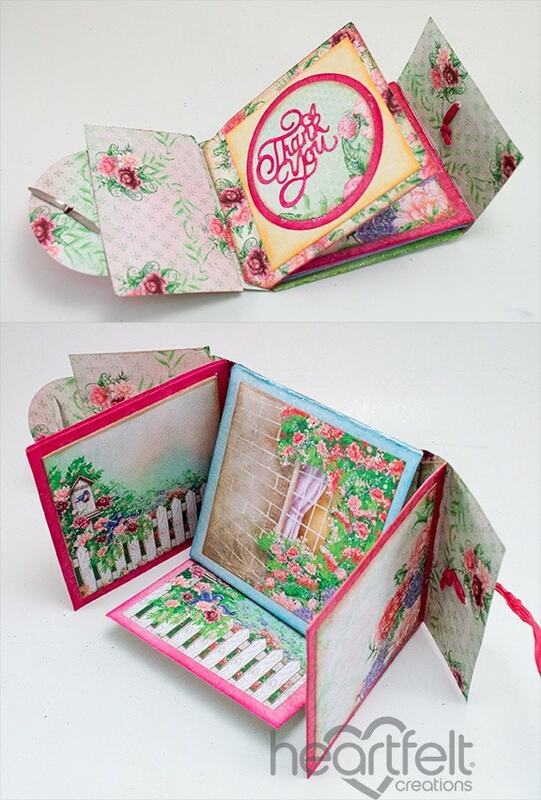 The Gift of Love Box Die is used to create this Mini Booklet. First use the Gift Box Base Die to cut the Sweet Peony design paper. Cut off all the tabs on the edges. Lay the straight edge of the base die cut on the Scor-Pal at 0" and score it 1 1/4" and 4 1/2". This creates the base of your Mini Booklet. Continue to use the Gift Box Base Die to cut 8 more from the design paper. On each one cut off the curved end and the 1 1/2" straight end so that you are left with the 2 1/2" x 2 1/2" square, including the tab on one end. Sponge edges of papers, as desired. Adhere the wrong sides together so that you are left with 4 pages remaining to insert in the base. Using the Scor-Tool reinforce the score lines on the tabs and adhere tabs to base so that each page flips out from each side of the booklet. Using the Decorative Solid Panel Die from the Gift of Love Box Die, die cut 8 images from the design paper. Sponge edges of design paper as desired and adhere to each side of pages, making sure they are aligned how you want them on your booklet depending on which way the booklet will be used. To decorate one page use circle dies from the HCD1-7154 Eyelet Circle & Basics Small Die HCD1-7155 Circle Basics Large Die to matte the image and then adhere the "Thank You" die cut sentiment from the Butterfly Kisses Decorative Die Set. Cut a 1 3/4" x 2 1/2" piece of design paper and adhere it behind the front flap to completely cover your pages. Using the piercing tool from the Heartfelt Creations Deluxe Flower Shaping Kit create a hole to insert the brad and one to insert the raffia. Using the Luggage and Tags Die, die cut a hole reinforcement and adhere it to the hole that will be used for the raffia. Hot glue the back of the brad in place, making sure to allow some room under the brad so that the raffia can be wrapped around it. Insert Raffia into the other hole and tie a knot on the back. Trim off excess raffia. Attach self-adhesive Velcro, cutting to fit as necessary, on flap to help secure booklet if needed. With Dries Clear Adhesive add Blue Rain glitter to booklet as desired. Other Products: White cardstock, Yellow Cardstock. Instructions: Prepare a white card base 5 x 7" layered with a piece of the Butterfly Dreams paper cut 1/4" smaller. Cut 2 of the Fleur Borders out of white and one straight edge one as shown to adhere to, place D-Dots on the back and adhere to the card as shown. Stamp 2 of the leaves on white with the Eden Green, color with the Bamboo Leaves, cut out with the matching die, shape using the Flower Shaping Kit, and adhere to the card. Stamp the flowers on white with the Manganese Blue ink, color in with the For-Get-Me Not ink, cut out with the matching die, place in the Basic Flower mold, finish shaping using the Flower Shaping Kit, and adhere to the card around the leaves. Stamp the Fluttering Butterfly on yellow cardstock with the Black ink, cut out with the matching die. Cut out the butterfly background with the yellow cardstock, glue together, shape and adhere to the card. To finish, add glitter to the butterfly, flowers and leaves. Put Prills in the center of each flower and cut the tag out using the matching die and place at the bottom of the card. Other Products: Green cardstock, glue gun, Misti, black cardstock, Copic Alcohol Ink Markers (Flower- Y000, Y00, Y11, Y13, Y15, Y26, Y28, YG03, YG25, YG45, Butterfly - YR 04, YR07, YR09, YR18, YR20, YR24, YR27, Y00, Y11, Y15,E47, E44, E42, E40, C3, C5, C7), opaque white ink, mounting tape, double sided tape, Antique linen Distress Ink, X-Press It Blending Cardstock. For more tips creating with the Sweet Peony collection, watch the tutorial at https://youtu.be/L9_MLkvpGPQ. Instructions: Create a 5 1/2 x 5 1/2 inch top folding card base from heavy white cardstock. Cut a mat layer from green cardstock at 5 1/4 x 5 1/4 inches. Select the designer paper from the Butterfly Dreams Paper Collection and cut at 5 x 5 inches. Sponge the edges of the designer paper with Olive Green ink. Adhere the layers with double sided tape. Stamp the Butterfly using Memento Tuxedo Black Ink on X-Press It Blending Cardstock. Stamp the large peony and the buds from the Peony Bud and Blossom Die using Distress Ink - Antique Linen. Color the images using Copic Alcohol Ink Markers - (Flower- Y000, Y00, Y11, Y13, Y15, Y26, Y28, YG03, YG25, YG45, Butterfly - YR 04, YR07, YR09, YR18, YR20, YR24, YR27, Y00, Y11, Y15, E47, E44, E42, E40, C3, C5, C7). Accent the little dots on the edges of the butterfly wings using opaque white ink. Cut the images with the corresponding die. Die cut 4 additional butterflies on black cardstock. Stamp the leaves using the Large Sweet Peony Stamp Set on green cardstock. Die cut with the corresponding die set. Sponge the edges using Memento Olive Green ink. Shape using the Deluxe Flower Shaping Kit. Adhere the layers of the butterfly with mounting tape between each layer. Leave the edges free of tape and the wings look like they are fluttering. Using mounting tape, adhere the peony flower and buds as shown in the picture. Adhere the butterfly. Using Designer Adhesive, glue the leaves under the large peony. Using the Butterfly Dreams Paper Collection, find the sentiment and fussy cut. Adhere the sentiment using mounting tape. Instructions: Click here for more photos of this project. Vase: Die cut four sides of the Gifts of Love box. Assemble box and fold the top inside to form the vase for the flowers. Die cut 4 paper sides for the upper and 4 paper sides for the lower sides of the box and glue into place. Stamp, color and die cut the butterfly curvy border twice. Cut each of the borders in half. There will be a total of four pieces. Glue one completed piece to each side of the box and attach the ticket from the paper collection to the box side. Flowers and Butterfly: Stamp, color and die cut two sets of the blazing poppy on Art Foam Paper. Shape with heat tool and assemble with the stamens. Stamp, color, and die cut five sets of the large petunias on white card stock. Shape in 3D mold and assemble with the stamens. Place glue on the edges of the petunias and dip into crystal clear glitter to add sparkle to the flowers. Stamp and die cut large butterfly. Add small amount of glitter to the butterfly with glue. Attach the butterfly to the side of the box. Other Products: Hot Glue Gun, Misti, Big Shot Plus, Pearl White Metallic Cardstock, Paper Trimmer, VersaMark, WOW Whirlpool Embossing Glitter, Foam tape, Sizzix Butterfly Embossing Folder, Stampin Up Baja Breeze Stampin Glitter. Instructions: Tent fold card is 6" x 6". Score a 12" x 6" piece of Pearl White Metallic cardstock at 6" and fold on the score line. Cut another piece of pearl white metallic cardstock 6" x 6". Stamp the sentiment on this and run through the big shot in the butterfly embossing folder. Adhere to the card base using dimensional tape. Stamp the Fluttering Butterfly on pearl white metallic cardstock using VersaMark and sprinkle with Whirlpool Embossing Glitter. Heat set using the Heat It Craft Tool. Diecut with the coordinating die, lightly shape with the Deluxe Flower Shaping Kit and adhere to the card using double dots and dries clear adhesive. Stamp the Flowering Dogwoods on pearl white metallic cardstock using VersaMark and sprinkle with Whirlpool Embossing Glitter. Heat set using the Heat It Craft Tool. Diecut with the coordinating die and then shape the flowers using the Deluxe Flower Shaping Kit. Add dries clear glue to the centers and sprinkle with Baja Breeze Stampin Glitter. Adhere the flowers to the card as shown using a hot glue gun. What do you like best about what you just saw? So beautiful! Takes my breath away! Thank you for the stunning examples and for your talented creative staff! Beautiful cards. Love the butterflies , and the colours are so vibrant. they almost look alive. Butterfly hugs, Alluring winged wonders, Loving life, Magnificent Wings, Kissed dogwoods and Celebrating dreams. Love them all. Such a gorgeous collection of creativity. I feel so inspired by it all . I’m new to Heartfelt Creations and really excited to get into doing this kind of thing. Thank you for all the detailed instructions and supply lists! Wow. Every single project is amazing. Marie I just keep going back and looking at yours. It is so eye catching to me. I am still waiting on my collection to arrive. Getting anxious to play after seeing all the beautiful projects from the design team. Amazing collection . I just saved all of the Butterfly Dream card ideas. They're all so beautiful! I need to quit just staring at my HFC stuff and use it. The paper is so pretty I just stare them. I need to quit staring and use these beautiful papers, stamps and dieas to make beautiful art to share. Thanks for sharing all of these ideas and the instructions to make them. Thank you for always making it so easy to create with your products.